I realize it was the middle of summer, but I was curious about the gumbo of the day. 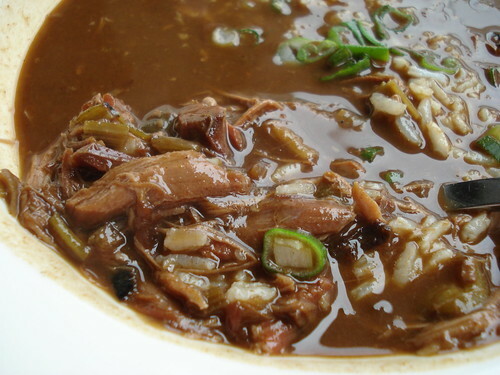 When I was told the gumbo was a duck and house andouille, it was a foregone conclusion. Through his restaurants and cooking at home, I’ve had a fair amount of exposure to Link’s andouille, so I had high hopes for this gumbo. 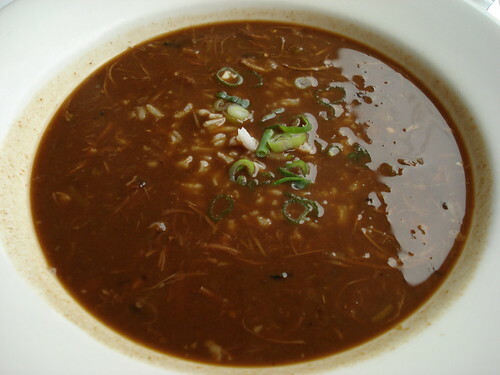 This bowl of gumbo actually looked a little watery, but a few spoonfuls proved there was a real depth of flavor here. This gumbo had required time to prepare and it showed. Littered throughout the bowl were chunks and flecks of duck and andouille. With the combination of a rich, dark, and spicy roux and that smoky andouille, this was the gumbo I’d been missing in Jackson. Simply because I’m incredibly indecisive, I had a trio of Herbsaint’s small plates on the way to my table. 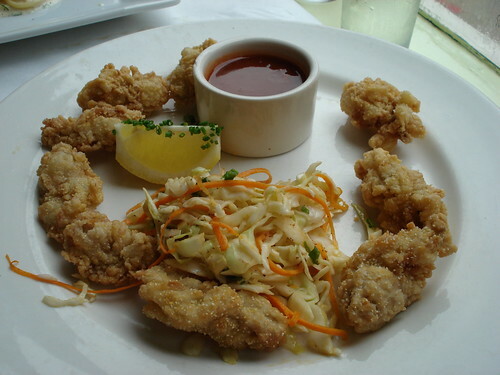 First was a plate of Cornmeal Fried Oysters with Hot Sauce and Cole Slaw. With this dish, it was really a case of letting the ingredients speak for themselves. Perfectly salted, well fried, and delicate, these were amazing oysters. 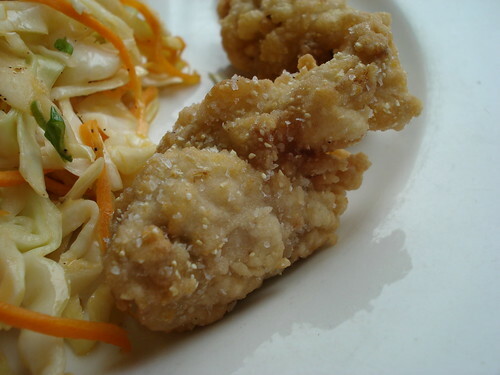 Actually the odd part of this dish was the Tabasco dipping sauce, it completely overshadowed a stellar fried oyster. Louisiana Shrimp and Grits with Tasso and Okra was the next small plate, and it was a joy to see Louisiana shrimp proudly displayed on the menu. The shrimp were small, but they had a brine like taste. Each shrimp was bursting with a condensed shrimp flavor. In the middle of the plate was a perfectly cooked grit cake that was not at all over salted. 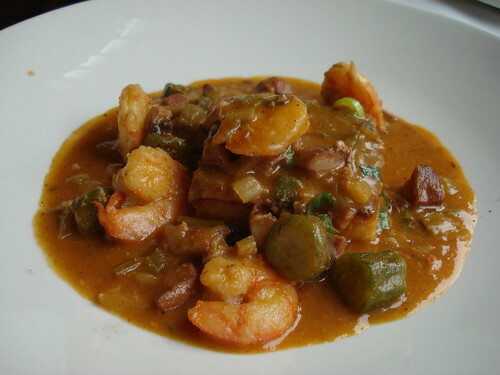 Swimming in an excellent brown sauce, the okra and tasso rounded out a truly pleasant dish. The last of the small plates was my favorite but it threw me for a bit of a loop. When it arrived at the table, I had completely forgotten this was Housemade Spaghetti with Guanciale and Fried-Poached Egg. 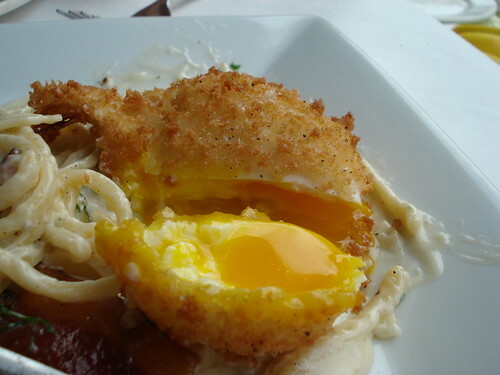 All I remembered was housemade spaghetti, so I initially thought that was a fried stuffed shrimp on top. Imagine my surprise when I tried to cut the shrimp only to reveal the yolk of a barely poached egg. The good folks at Blackened Out revealed that the egg had been lightly poached, peeled, coated in wondra flour, and fried. 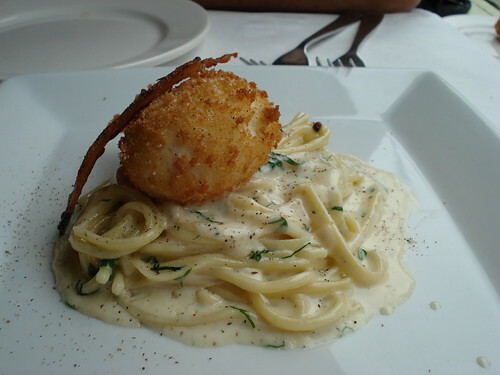 Well, when the egg was combined with a rich, but not overpowering cream sauce and expertly cooked spaghetti, this was an almost ethereal plate. The one thing keeping it tethered to the ground was the guanciale. While it was a tasty piece of cured pork, I couldn’t really figure out where it fit in the dish. Maybe a second piece would make it seem more pronounced, but that might be porcine greed speaking. Having just enjoyed three small plates and a cup of gumbo, I had no intention of ordering dessert but my waiter was an excellent salesman. 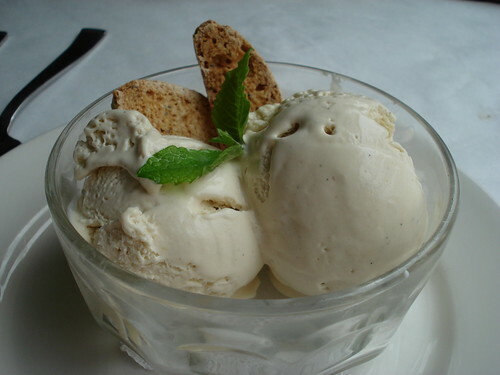 The first dish I was conned into buying was a dish of Café au Lait ice cream. Conned was the wrong word because this was a staggering example of coffee ice cream at its finest. 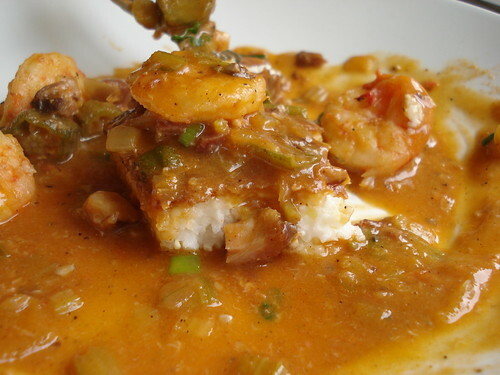 With the forward taste of a New Orleans roast coffee, the creamy and rich texture rounded out the dish. It was staggeringly delicious. 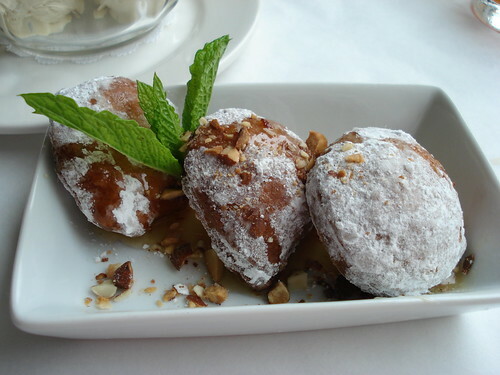 The second dessert sounds like an odd combination, Fried Goat Cheese Beignets with Lavender Honey. At first I thought these looked more like fried macaroons than beignets, but these were beignets and they were gorgeous. 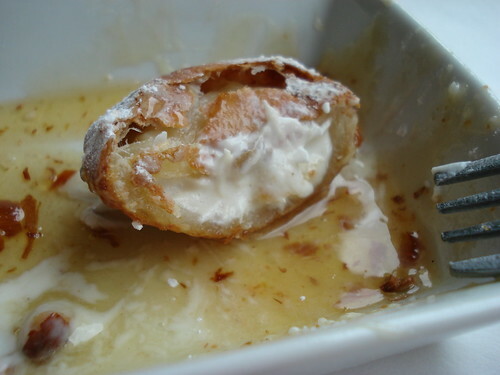 Each beignet was bursting with tart, melted goat cheese, and that tartness was well complimented by the stellar honey. The dough of the beignet, the sweetness of the honey, and the characteristic goat cheese flavor was a stunning combination. I’ll have to admit, I am a fan of Donald Link and his work. I can’t make a trip to New Orleans without stopping at Cochon Butcher. I’m pining to make another visit to Cochon. I cook from his book, “Real Cajun”, on a regular basis, and now I’m enjoyed a wonderful meal at Herbsaint. There really isn’t much left to say, except that Donald Link earned that James Beard award on the wall and Herbsaint is an excellent choice for lunch.